After weeks and months of speculation, we here at Tapscape finally have some details regarding the soon-to-arrive Motorola X phone, officially named the Moto X. Before you read further, let me give you a heads-up: as with every tech gadget on the planet, there is always surprising news and disappointing news. So don’t be surprised if the Moto X presents the same. The Latest on the Moto X Phone : How Customized is “Customized”? When Will Google Announce the Moto X? 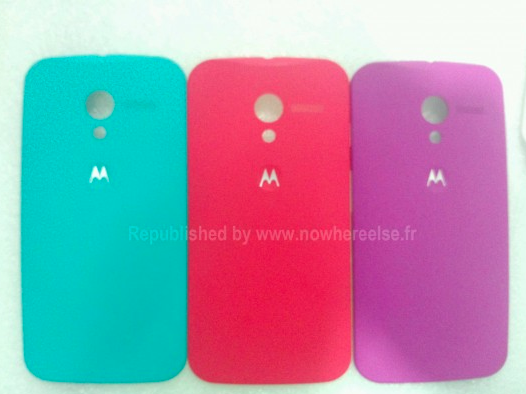 It was said weeks ago that Motorola would allow consumers to customize their Motorola X phone. Well, the broad rumor was true: users will get some measure of customization in the user experience. The first smartphone designed, engineered, and assembled in the USA is coming. Tomorrow, you’ll eat burgers, watch fireworks and celebrate the freedom to be whoever you want to be. It’s with this same spirit that we’re bringing you something new. The first smartphone that you can design yourself. Because today you should have the freedom to design the things in your life to be as unique as you are. And this is just the beginning. Imagine what will be possible when you have the world’s best design, engineering and manufacturing talent located here in the USA. We know this would be a challenge. In fact, some people said it couldn’t be done. But we’re not just any company. And nothing this exciting ever comes easily. Designed by you. Assembled in the USA. Notice the words above in the ad, where Motorola says that the Moto X phone will be “the first smartphone that you can design yourself”? We have a clear indication here that the user experience will involve more than just selecting what memory storage version you want (although Motorola has made room for memory storage selection in the Moto X experience as well). In the very next sentence, Motorola talks about “the freedom to design the things in your life to be as unique as you are,” another reference to a customized design. We’ll get into the customized design in a moment; just keep reading. You have to give credit to Google for sending this ad on July 3rd, the day before Independence Day. While I think that this advertisement “rings” with truth the day before the nation’s independence day, I also believe Google has done this because it is the perfect message to go along with the Motorola X phone’s new customizable experience. It’s high time we get to customize our phone experience in more ways than one. So what exactly do we know about the Motorola X phone (or Moto X)? After all, we’re told by Google/Motorola in the Moto X ad that the handset will provide a customized experience, but what does Google mean by customized design? Whatever definition we can gather from the information, we cannot leave out memory storage. This is the standard definition of “customized” for handsets today. “Customized” means more than just memory storage, at least for the Google-Motorola partnership. In addition memory storage, customers will also get to select the case material, apps, wallpaper, and even ringtone when ordering the Motorola X phone (Moto X) online. As far as case materials, customers will have four choices: metal, carbon fiber, plastic, and wood. Customers will also get to select the color of the back plate of the Motorola X phone (Moto X) as well as the color for the phone trimming, according to ABC News. According to the photo above, three of the colors customers will get to choose from are teal, red, and purple. The real question for most consumers is, “How far can customers go in their customization?” If an individual wants to load the latest song from Justin Timberlake or Kanye West as his or her ringtone, will this be possible? And can my ringtone preference consist of any ringtone or song from the Google Play Store? As for app selection, what apps are off-limits? I suspect that third-party apps that are unapproved by Google will not be part of app customization – that is, unless you choose to root the Moto X and install custom ROMs. Also, only Google Play Store apps will be allowed, meaning that Google/Motorola will not port apps to the phone that do not currently exist on Android. The good news behind a customized app experience is that those who don’t want certain apps that are normally installed with a contract smartphone (what many refer to as “bloatware”) need not worry about bloatware. Your Motorola X phone’s memory will not be eaten away by apps that you never use or don’t want. While most individuals load their own wallpapers onto their smartphones after they purchase them, Motorola is willing to pre-install your favorite wallpaper so that you will have everything loaded, right out of the box, once your phone is delivered to your home or office address. Along with wallpaper customization comes the “freedom” to engrave your handset, whether you want to place a name or message on it. We do not know at this time if Motorola will allow both a name and a message, although I do like the thought of having a name and message as I do on my iPad 3. Remember earlier when I said that every phone, including the Motorola X or Moto X, would disappoint at some time or another? Well, the time has come. The customizable user experience is wonderful, but it will only come to those who order their Motorola X (or Moto X) online. For those who expect to buy a standard edition, know that you will get a factory version of the phone, no customized features added. It would be a nice feature if Google/Motorola would produce four versions of the same smartphone – with each having a different case material to them. While this would be nice, we do not know if Google/Motorola intends to do this. We will have to wait and see with the upcoming Motorola X (Moto X) announcement. 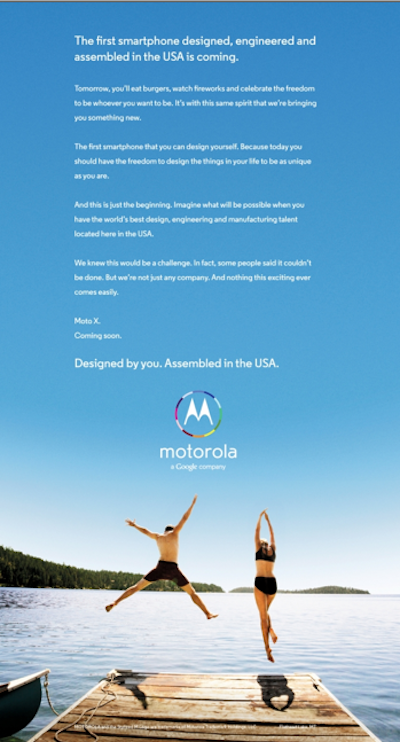 Recent rumors place the upcoming Motorola X (Moto X) announcement around June 11th, this coming Thursday. Google just placed the Moto X information sign-up page on the web earlier this week, and sources say that Google’s timing is perfect if you factor in an announcement one week later – after the sign-up page goes live. The Motorola X (or Moto X) specs and features have been published across the web for some time, but you can go here to find them. As for the arrival date, sources say that the Motorola X (Moto X) handset will ship in the US come August 2013, with other countries to receive the Motorola X handset later this Fall. Are you excited about the rumored July 11 announcement? What would your ideal Motorola X phone be? What type of case material, wallpaper, apps, and colors would you prefer on your Moto X smartphone? We wanna hear from you.